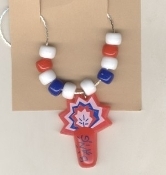 Funky FIRECRACKERS PENDANT NECKLACE - Fireworks Patriotic Summer Holiday Picnic Charm Novelty Costume Jewelry - Celebrate your INDEPENDENCE DAY party spirit, not just on the Fourth of July, Mardi Gras or Chinese New Year - Dimensional Plastic Charm, approx. 1-5/8-inch (4.06cm) high, on 18-inch (45cm) neck chain with safety clasp. Surrounded by Red, White and Blue beads. Have a Bang!